The Dodecanese Islands are perfect for some Greek Island hopping! Last summer Ben and me spend one week (to be more specific eight full days) to discover the amazing islands of the Dodecanese. The trip included history, relaxing, a volcano, city trips, beaches and of course good food. I will tell you something about the highlights and I think this blog can be very useful when you are planning a Greek Island hopping trip through the Dodecanese Islands. The Dodecanese Islands are the most southern Islands of Greece and because they are the furthest island group from the Greek mainland they are ruled by several foreign besiegers. It is because of this that you can find so many historical traces on the islands from different timeframes and different super powers. The most famous besiegers will probably be the Knight Hospitallers, but also the Dorians, the Ottomans and the Italian left their traces. The Dodecanese Islands offers you lots of variation because of its rich history, but that is not the only reason. Actually each single island in the Dodecanese is unique and this is also thanks to the different geography and nature. Although a lot of beaches will be found on all the islands, none of them is really the same. The mountains of Rhodes are pretty high, but very green. Kos is on the other hand really flat, sandy and heathy. And then you have Patmos, with its rough nature and a lot of grass and hills. The most impressive nature will probably found on the active volcano Nissyros. A third party that for sure has an important role on the variation of the islands are of course the tourists. On Kos and Rhodes you will find a lot of western European tourists, which leads to a different taste of food and a lot of huge resorts. Some of the islands are not even discovered by any kind of tourist yet, there is not much to do on these islands, but they will offer you a unique atmosphere. Furthermore you have islands like Patmos, which is mostly popular by Greek tourists or yacht travellers. Whatever you prefer for you vacation, the Dodecanese can offer it to you for sure. I can honestly say that island hopping through the Dodecanese was one of the most intriguing trips I have done so far. I cannot think of one single moment I got bored on the Island of Rhodes. To be honest, the Island was exhausting me at some point, but in a good way. Rhodes is the biggest island of the Dodecanese and has an amazing history, which especially can be found in Rhodes Old Town, the amazing and oldest inhabitant medieval town in Europa. Walking around in Rhodes Old town feels to me like going back in time, I loved it and it made my imagination grow. However, in my previous blog about Rhodes Old Town, you can find all the details. Furthermore the nature on the island of Rhodes is pretty impressive. Ben and I discovered the Island by car which brought us to some stunning views and lovely rides through the mountains. There are some lovely springs to admire and our visit to the Butterfly Valley felt quite unique. Also unique and very beautiful is the combination of history and nature which is in particular impressive at the Monolithos. The main reason I wanted to travel the Dodecanese, Patmos. Actually because of the fact that Saint John wrote the Book of Revelation on this island. However, the island didn’t disappoint me at all. I fell in love with it from the moment a set foot on it and my love for the Island only grew during the rest of my visit. The holy atmosphere on this island I just impressive. Our hotel was great, It was place close to the harbour of Skala, but on a quiet place in front of the beach. At night we could even hear the sea and in the morning the first thing we saw was an empty beach and green mountains. I couldn’t wish for more. After an interesting and a bit strange visit to the Cave of Saint John, we walked through the Monastery of Saint John. An interesting place for history lovers (especially when you’re interested in the Christian history) and architect lovers. I admired the centre of the Monastery, a courthouse with a floor with peddle stone mosaic and lovely bows above it. Even more imposing is the main church with beautiful and holy treasures inside. While walking through the monastery you will meet the monks wishing each other a good morning and taking care of their beautiful place. 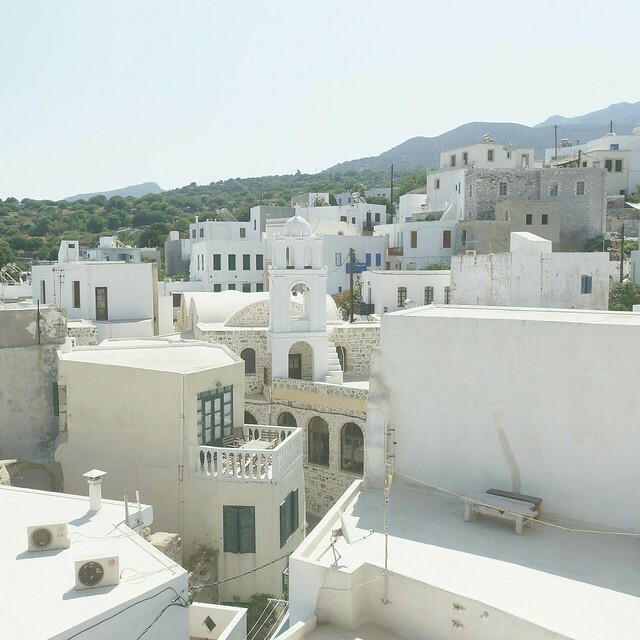 Ben and I also made a one-day road trip through Patmos. The trip surprised us with its beautiful nature and stunning views. There are some organized beaches, but even greater are the undiscovered and quiet beaches where Ben and I made a stop for a picnic. More details about my experience on Patmos can be found here. Of course there is much more to see and discover in the Dodecanese. 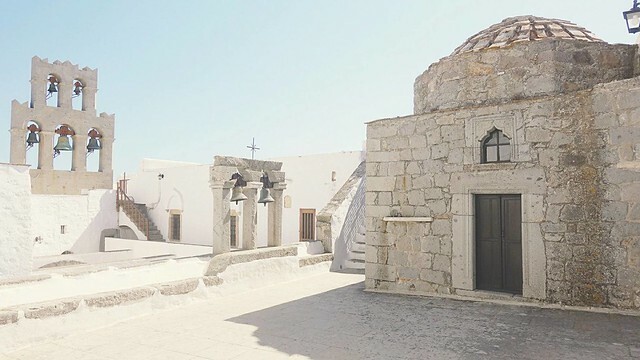 For example the Neoclassical buildings at the harbour of Symi, the rocky and uneven nature of Kalymnos and Karpathos and the fertile and green Astypalaia. Ben and I only had one week, which unfortunately is not enough to discover all the beautiful islands of the Dodecanese. Ferry tickets: A ticket from Rhodes to Kos and Kos to Patmos will be about €25,- (one way). The price of the ticket will mostly depend on how far you have to travel. A ticket from Rhodes to Patmos for example will be more expensive, but will also take more time. Flight: Prices for a national flight with Ryan Air starts from €16,- (one way) and can go up to €100,- (one way) for a flight with more service. Prices for food: Restaurants will cost about €20,- (without alcoholic drinks), A cheap meal will cost about €10,- and a Gyros lunch will cost about €3,-. How much time you need: Ben and I managed to visit Rhodes, Kos, Nissyros and Patmos within eight days. If you would prefer some time to relax in between you might take a few more days. However, if you are planning to visit more islands of the Dodecanese you will at least need two weeks. Map: On this map you may find the highlights I described before. When you zoom in you also find the Ferry lines for the Dodecanese. Depending on how much time you have, it is probably not possible to visit all the beautiful islands of the Dodecanese. Make sure you spend enough time on each island to discover its hidden treasures. Discovering more parts of the island will be much easier when you rent a car. Public transport in Greece (and especially on the Greek islands) is not something you can rely on. Also the islands can be hilly and some of them, like Rhodes, are pretty big. Of course renting a scooter or quad is also a (popular) option, but not as safe as a car. Also I prefer the luxury to bring food, towels and other stuff that might be useful. Do some research and know which highlight you want to see for sure. Even when you are not such a research freak like me, the Dodecanese Islands have so much to offer that you will probably get overwhelmed if you haven’t done any research. Don’t plan a flight on the same day as your ferry trip, our make sure you have at least 8 hours in between. Like the public transport the ferries are having a lot of delays (it happened to Ben and me twice) and sometimes they do not even show up. When you are planning an active trip or you are not specifically planning a sunny holiday plan your trip in April or May, or at the end of summer in September. The island will be less hot and less crowded. Ferries are much better than airplanes! At least, that is my opinion. We did not buy a business ticket, and in this case don not expect too much luxury, when you are very unlucky the boat can even be overbooked and you have to sit at the bar for a few hours. However, the ferry does offer electricity, restaurants, comfortable seats and you can have much more stuff with you. Also skipping the long waiting on the airport and the possibility to walk around is a great plus. And last but not least, the view on the islands is just amazing, especially when you are traveling during sunset. The Dodecanese Islands are so lovely. If you need any tips, don’t hesitate to write me 🙂 Thanks for posting.